I did not make any calculations beforehand this year, but I’m not surprised that I crushed last year’s Tour de France in terms of altimeters. I’ve experienced that the (average) grades in France are slightly lower than in Italy, or at least the parts where I inch up the mountains. In the Giro d’Italia of 2011, the average gradient came to 7% and in last year’s Tour de France, it was 6%. Not surprisingly, the average for this year’s Giro was (slightly) higher than that of 2011: Garmin is more moderate with an average of 7.1%, whereas Strava gives me a whopping 8.1%. I’ve let half of the iPhone recordings prevail over the Edge recordings for my official Strava entries – sometimes I was late in starting either recording, or the Edge would fail me, like during the climb of the Giau. Taking into consideration that most rides were “round trips”, the 50/50 rule is applied, i.e. half the distance is considered as “climbing”. On average, according to Strava, each stage took just over 4 hours, covering 78.8 kilometers, with 3,203 meters of elevation. 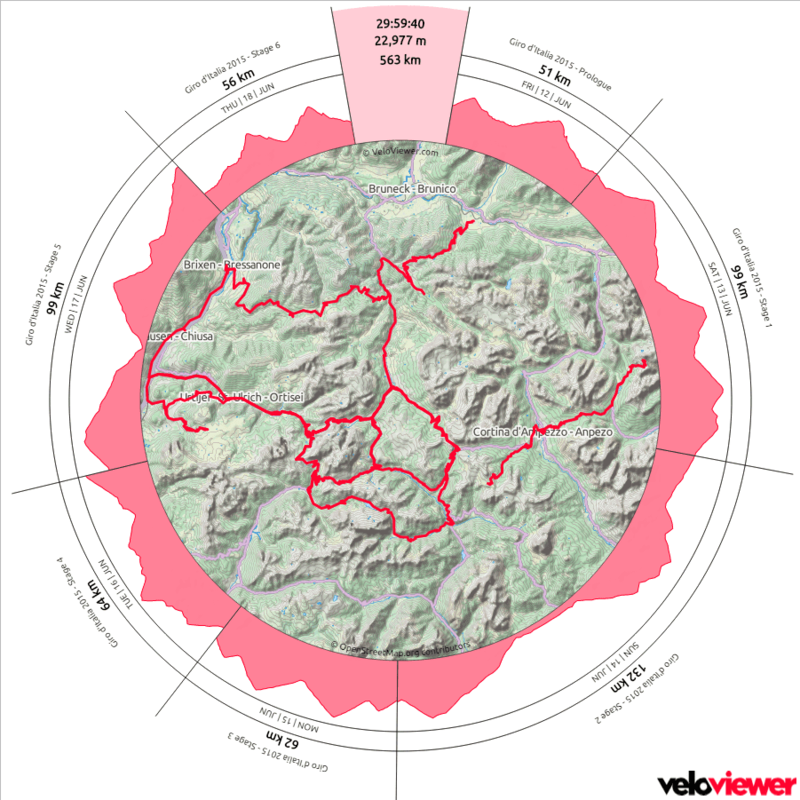 Garmin calculated 4 hours too, covering 77.7 kilometers, with 2,763 meters of elevation. Averaging both: 4 hours, 78.3 kilometers, 2,983 meters of elevation (7.6%). Compared to last year’s Tour, this is less kilometers, but with more elevation gain, per stage. Longest stage was stage 2, when it was pouring rain most of the day and I covered 132.3 (127.5) kilometers in 6 hours and 40 minutes moving time (8:12 total). That stage also had the highest elevation gain according to Strava: 4,862 meters, including the Würzjoch and the 30+ kilometer ascend of the Gardena. 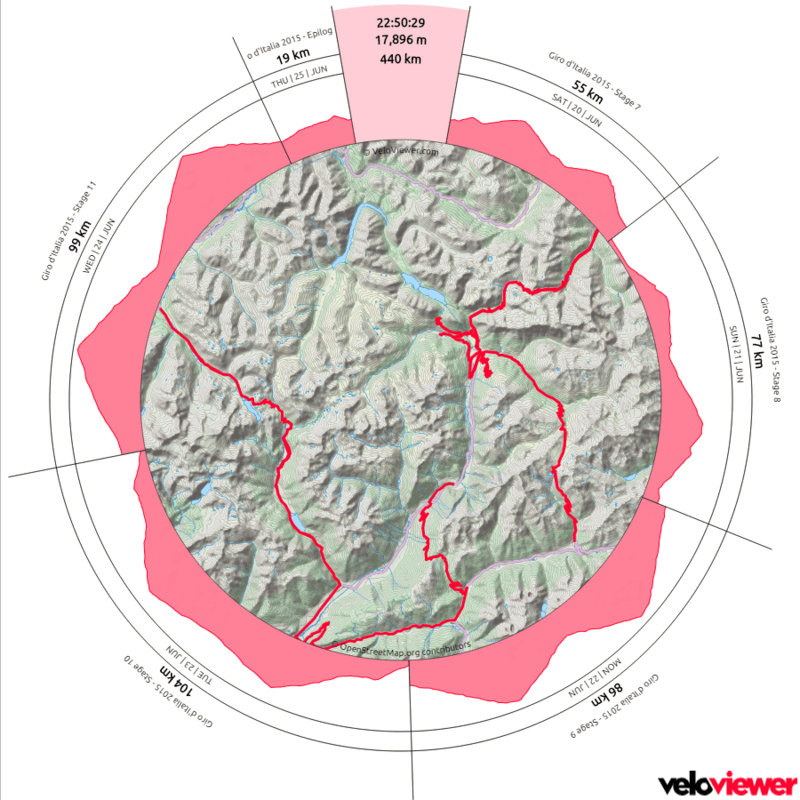 Garmin agrees about the length of that stage, although it recorded “only” 6 hours and 5 minutes of moving time, but it rates stage 11 with 4,352 meters of elevation as “Cima Coppi”, which literally was the case too, as it was up the Stelvio from both ends. Strava recorded 4,793 meters for that stage. Neither is close to the official combined elevation on those two climbs, but that is not always accurate either. The official numbers are just mathematically correct when calculating the elevation gain by subtracting start (height) from finish, but they do not take drops into consideration. I think that stage 4 to Tre Cime di Lavaredo and Giau probably wins as far as highest average grade is concerned: Strava recorded 9.5% and Garmin 9.8% (corrected). According to the StravistiX extension, the (estimated) average weighted power was 425 Watts, but I’m not sure what that means. Strava itself usually comes up with low(er) estimated average power numbers – for this Giro, it’s 260 Watts. But, I’ve noticed that without a power meter, these estimated power number do not mean a lot. 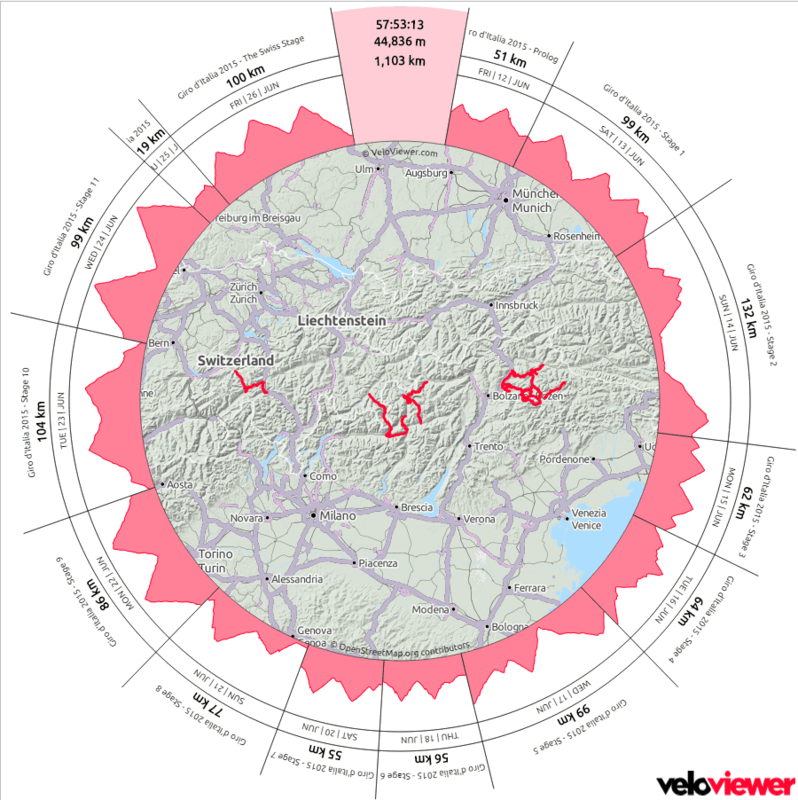 So, there you have it, the cool nerdy stats of this year’s Giro d’Italia. It brought me a lot of joy, taking in the breathtaking views, some disappointments when those lacked completely (Tre Cime, Giau), a lot of pain and suffering. I’m sure the minions enjoyed watching me – and I earned a top spot in the Strava “Climbing for Nepal” challenge. However, none of this would have been possible without the support of my eternal love, Paula. She was watching over me, guarding my back and help me fight head winds by pacing me with the car, every single kilometer of every single stage. And picking up the pieces, patching me up for the next one, nearly every single day. I (just) did the cycling – she made it possible. Awesome stats Robert! I’d be lying if I said I wasn’t jealous! Also, tell your wife she is an amazing woman!